After hours of swimming in the beautiful San Marcos River, you are likely ravenous. The good news? 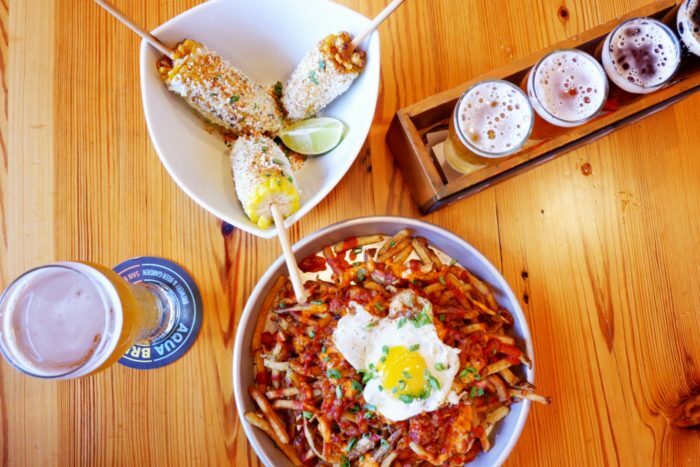 San Marcos has a brewpub with cold beer and delicious food, mere minutes away from Pecan Park. 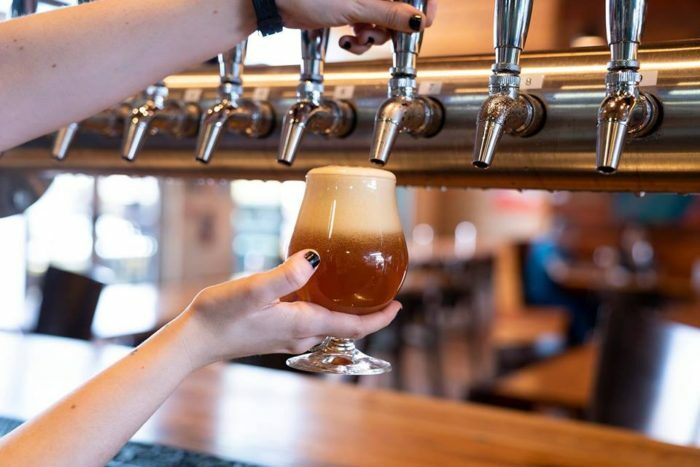 Family-friendly, dog-friendly AquaBrew Brewery & Beer Garden is beautiful and inviting with plenty of natural light streaming in through the windows. Gleaming silver tanks, a row of colorful taps, and friendly employees welcome you as you enter the brewpub. AquaBrew’s large, bright, and airy taproom feels casual, with picnic tables and barstools for you to choose from. If you want to keep the outdoor vibe going, head to the outdoor beer garden or upstairs to the rooftop bar. Beer nerds, rejoice! You can geek out all you want talking craft beer to your servers at AquaBrew. The team takes great pride in its tasty beer, and staff members are happy to give notes on the choices. Brewmaster David Jones, a 15-year pro in the beer industry, has a lot to do with that. It’s also worth noting that founder Carlos Rosso comes from an engineering background, so he knew investing in high-quality equipment was crucial to brewing the freshest, tastiest beer. Rosso dug in his heels, did his research, and started building a dream: a gathering place where neighbors meet neighbors, strangers meet regulars, and everyone becomes part of the AquaBrew community. The beer selection is impressive, as AquaBrew usually offer more than 10 choices. The AB Skyscraper Mosaic IPA, Swine Dive IPA, San Marcos Blonde, and Ape-Pricot Wheat are some of the staples. The AB Skyscraper is so popular, in fact, that Rosso chose it to launch his line of canned beer to be sold around the state in other bars, plus grocery and convenience stores. Look for it out in the wild! The best way to decide which AquaBrew beer you like most is to start with a beer flight. AquaBrew also sells crowlers (32-ounce aluminum cans) to go, and reusable, river-friendly growlers in brightly-colored plastic with handles. Call ahead to schedule a brewery tour. 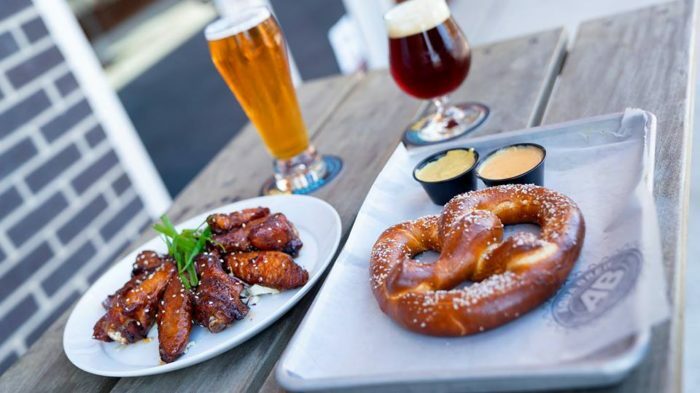 Besides the ambiance and good craft beer, AquaBrew serves delicious food to satisfy that hunger one only gets when coming off of the river or hiking trail. They have all the classics like burgers, pulled pork sandwiches, wings, and brewhouse pretzels. 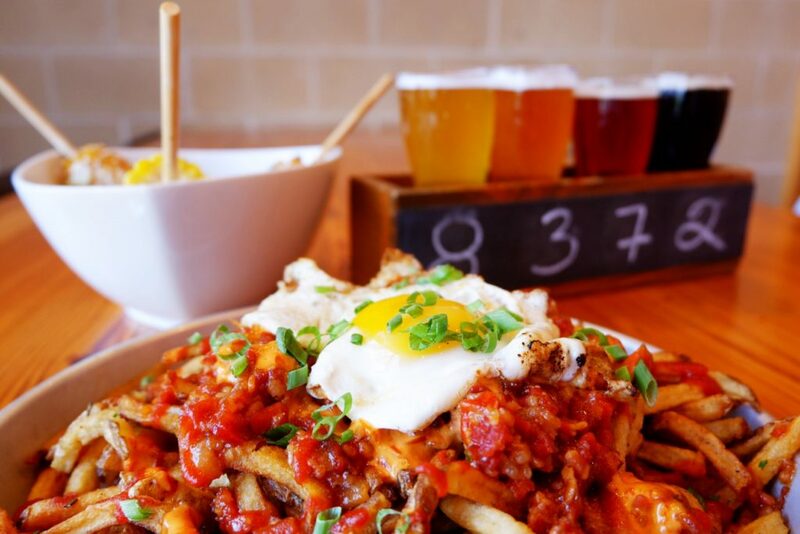 The venue also serves fun dishes like fries with bacon jam and sriracha with a fried egg on top, and AB street corn (elotes). AquaBrew often has daily specials like Thai curry dishes. 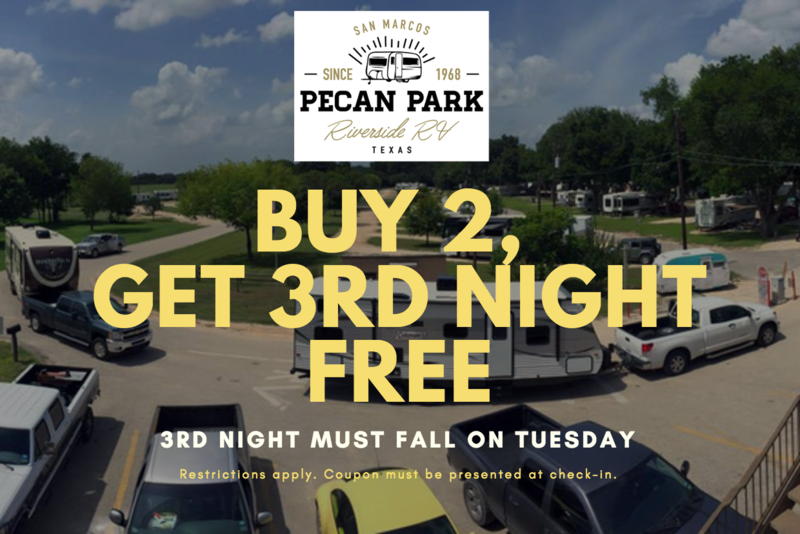 Keep an eye on the Facebook page for specials. AquaBrew has a decent, if not extensive, range of vegetarian food, too. For dessert? Try the beeramisu, of course! Don’t forget the live music. Every Friday, Saturday, and Sunday night, AquaBrew has it (schedule on Facebook page). 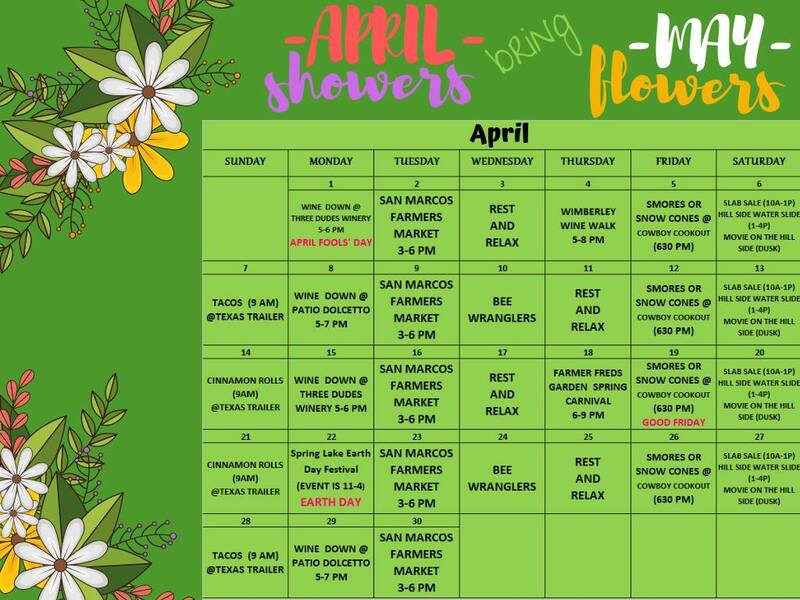 They also are open for brunch on Saturday and Sunday from 10 a.m. to 3 p.m.
We hope you enjoy this brewpub right off of the main square in San Marcos, TX!